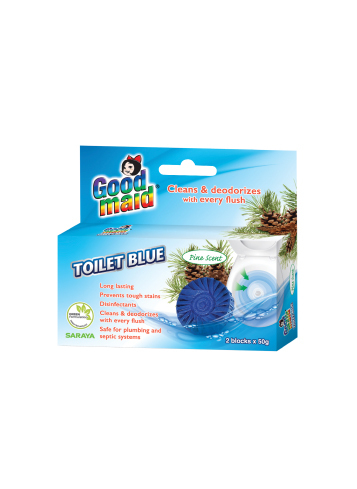 Toilet Blue - Goodmaid Chemicals Corporation Sdn. Bhd. Use it to clean and deodorizes the toilet bowl with every flush. • Lab test proven that each drop is able to last more than 150 flushes. • Disinfects and does not leave stains. • Safe for plumbing and septic systems. • Tear open pouch. Do not remove pleated wrapping as it dissolves quickly. • Drop the tablet in tank near side wall closet to float, away from water valve opening. 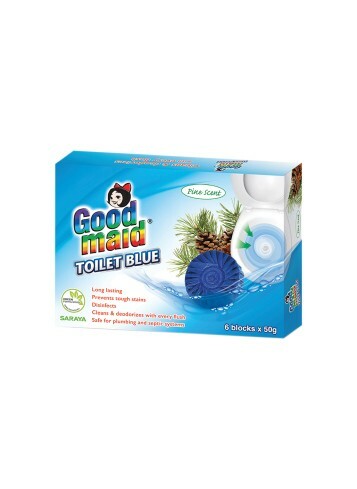 • Replace with new Goodmaid Toilet Blue Tablet when colour starts to turn lighter. With SUPERCLEAN Formulation to remove tough stains and kill germs.